I haven’t been posting much as we’ve been pretty busy with work, visitors, travelling etc. We have also been eating out far too much and last night I decided we really need to cut down on the gluttony. This recipe was really quick to throw together (we always have frozen scallops in our freezer) and the result was better than any gourmet meal. Simple and light, but still very interesting and tasty. Pat the scallops with paper towels until dry. Coat in flour mixture, dip in egg and then coat in panko mixture. Make sure to press the panko in well. Set aside for a few minutes. Giving the scallops some time will help them dry out a little and the crust will stick better to them. Heat oil in a pan and shallow fry scallops on both sides until golden brown. Make sure the pan isn’t too hot. Remove scallops and let drain on paper towels. Mix sandwich filling with a little lemon juice. 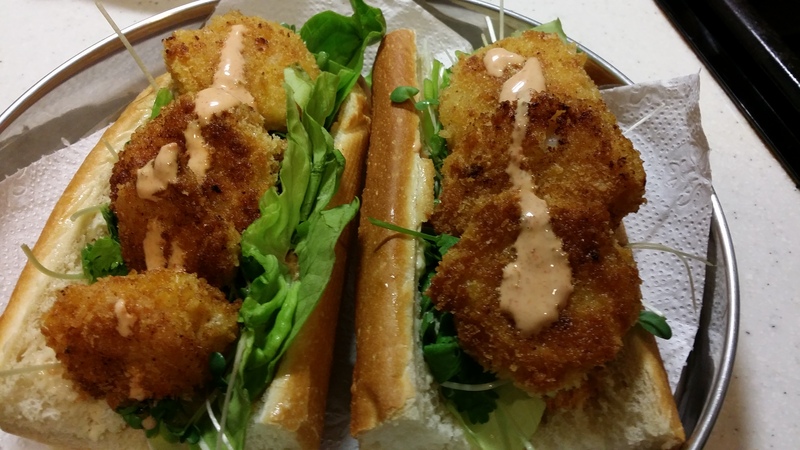 Prepare sandwiches by spreading some chilli mayo on one side of the bread, add sandwich filling, stuff scallops inside. Add a little extra mayo if you wish. Enjoy!